Dr. 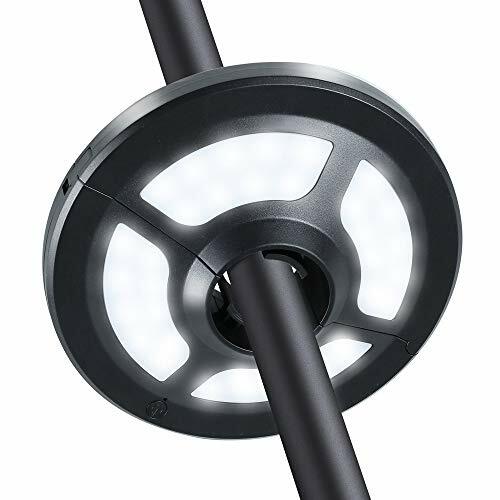 Prepare umbrella light is a multi-function product. Cordless and soft light design will look great on your umbrella, safety and convenience, suitable for most patio umbrellas and easy to install. ●Powered by USB Cable: Insert the included USB cable into the DC Socket, then connect it to the USB port (power bank, computer or wall charger indoor). You can use the light without batteries. ●Powered by Rechargeable Batteries: Put 3x AA rechargeable batteries in the battery slot. This is convenient for you to continue enjoying a meal, play cards or just have a friendly chat with friends. ●Clamp the light: Open the OPEN Toggle Clip. Keep the light facing down and clamp it to your umbrella with the built-in auto adjustable clamp. ●This product is not waterproof. Please do not use it in the rain or keep it wet for a long time. ●Please load the battery correctly by positive and negative polarity. ●The working time is determined by the battery capacity. ●Do not touch electrical appliance with wet hands or when liquids are present. ●Please keep the light clean and clean it only with a soft dry cloth and do not use solvents or cleaning solutions. 【EYES-FRIENDLY LIGHT】Soft pure light to minimize eye fatigue and 36 pieces SMD2835 LED chips are perfect for party or camping. 2 lightning modes are available. 【DUO CHARGING METHODS】This Umbrella light can be charged by a power bank, computer or wall charger through an USB port. lt also can be powered by AA batteries (3 rechargeable AA batteries are included). 【ECONOMY & DURABLE】3X AA rechargeable batteries make it more economic and environmental-friendly. The service life of these LED lights is up to 50,000 hours. 【CORDLESS DESIGN & EASY INSTALLATION】 Cordless design, no tools required. Clamp this light on your umbrella and enjoy the brightness. 【WIDELY APPLICATION】It can be used as umbrella light, camping tent light, and temporary emergency light. Perfect for BBQ, eating outside, playing cards, or just sitting on the patio or lying on your leisure chair in the evening with your families or friends.